The monthly magazine Iran Farda, which is aligned with Nationalist-Religious groups in Iran, has resumed publication for the first time in 14 years. The Shargh daily reports that Iran Farda was banned in May of 2000 and has been absent from Iranian media ever since but it's about to be published anew now that "all legal obstacles have been removed." The late Ezzatollah Sahabi ran the monthly in its previous incarnation; it will now be published by Hamed Sahabi with Badrosaldat Mofidi as editor in chief. Ezzatollah Sahabi, the head of the Nationalist-Religious Council. passed away in June of 2011. 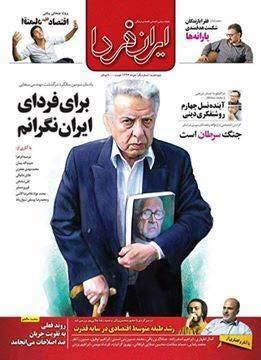 The first issue of Iran Farda will publish material related to the anniversary of its late director as well as articles on Iran's political and economic situation.